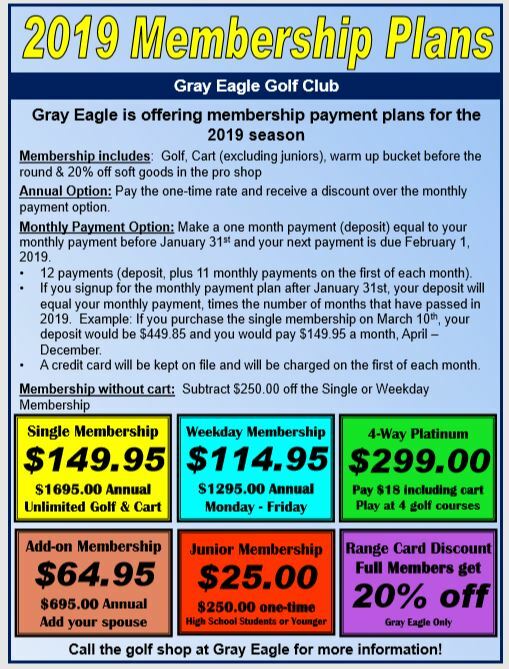 Gray Eagle Golf | Come and Play! Gray Eagle Golf Club features 18 beautiful golf holes featuring bent grass tees, greens and fairways. Whether players seek the course’s ultimate challenge from its 6,739-yard gold tees or testing their skills from its blue, white, green or red tees, Gray Eagle Golf Club is one of central Indiana’s premiere golf course destinations. Practice makes perfect. Gray Eagle Golf Club features one of the area’s largest indoor and lighted outdoor driving ranges and practice facilities, with practice bunkers and greens, gas heated practice stalls, an indoor year-round practice green and indoor golf simulators. Gray Eagle Golf Club has a popular men’s club, the Mud Creek Men’s Club, that plays at sister course Ironwood Golf Club, a vibrant and growing Junior Golf program that features instructional learning and end-of-season tournaments in the summer, Operation 36, and several camps and clinics year round. Check out the information on our Gray Eagle Friday Night Couple’s League. Save Money On Green Fees and Book Online!